Shares in music and book retailer HMV Group have fallen 16% after the firm issued a profit warning as it launched a "radical" review of the business. HMV said sales had deteriorated further since the start of 2007 and that annual profits would be lower than expected. The retailer is likely to close loss-making stores following a review of its entire estate of 421 HMV outlets and 329 Waterstone's book stores. The review could lead to job losses but HMV would not comment on this. Changing trends in the music market, with more and more consumers downloading songs rather than buying physical copies, has hit HMV hard. Is HMV still 'top dog'? "Waterstone's and HMV are great brands but have not adapted quickly enough to the way customers are now buying and consuming media," said chief executive Simon Fox. "Our performance has suffered as a consequence." HMV said group like-for-like sales - which strip out the impact of store openings and closures - were down 3% In the nine weeks to 10 March. As part of a three-year turnaround plan, HMV plans to save £40m by 2010 by reviewing all aspects of its business, including its stores, supply chain and administrative operations. Unprofitable stores plus those deemed surplus to requirements following Waterstone's purchase of Ottakar's last year are likely to be closed. HMV also plans to refurbish its stores and introduce new products including portable music players and gift stationery at Waterstone's. It will also launch a social networking site for music and film enthusiasts and increase investment behind its own online retail site. Keith Bowman, Hargreaves Lansdown Stockbrokers. HMV said it was "confident" that its proposals would improve its fortunes, having seen its profits fall 20% last year. "The three-year transformation plan is exciting, radical and far-reaching," Mr Fox added. HMV shares closed down 15.9%, or 24.25 pence, at 128.5p. 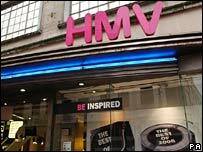 Analysts responded coolly to HMV's announcement, saying the firm's track record in managing costs was not a strong one. "Investor hopes have again been dashed via another downward estimate to profits," said Keith Bowman, from Hargreaves Lansdown Stockbrokers. "Today's update leaves investors requiring a further leap of faith in the group's potential turnaround prospects."